The Stormwatch title picks up steam again in this issue as the conflict with Etrigan the Demon heats up (literally!). 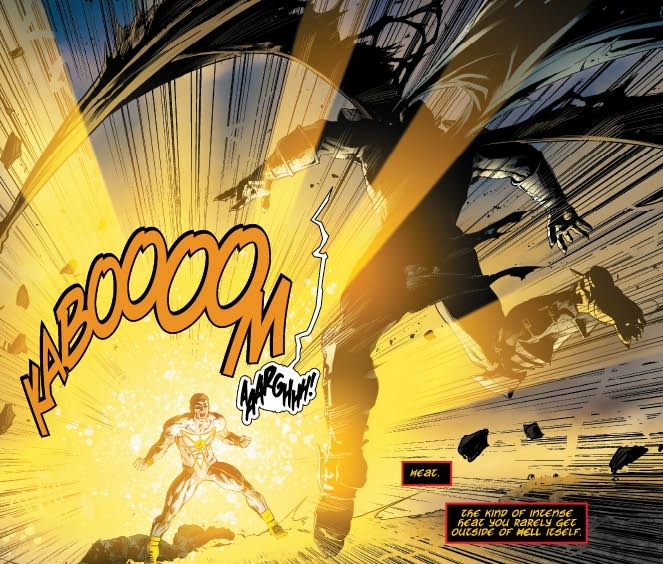 Milligan gives us a great battle which is complimented with some great Will Conrad art. On top of that Milligan starts to bring some threads together concerning Stormwatch’s former member turned foe, Harry Tanner, and his manipulations could spell the end of the team. I’ll admit I was a little hard on last issue because it was a set-up issue but I should’ve trusted Milligan to know that as soon as the set-up was out of the way, he’d kick the story up a notch. The Demon as he’s represented here is a lot more arrogant than I remember in Demon Knights. 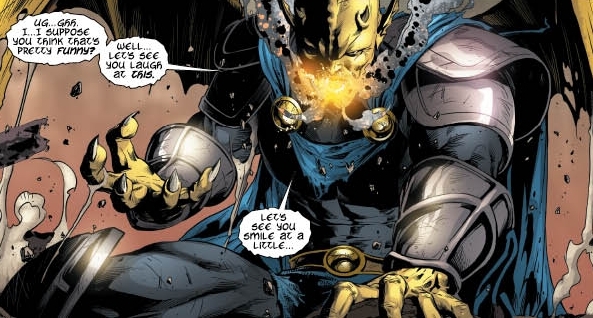 But it’s obvious by the things Etrigan talks about that a lot has happened since I stopped reading that title. I also love the new look Will Conrad gave the Demon. To me, it’s much cooler than his Demon Knights look. It was also nice to see Apollo finally unleash on a foe. I feel like he’s held back lately. I also love how the team dynamics are being put to the test here. The Engineer is not winning any popularity votes with her decisions as team leader (don’t want to spoil anything). She makes Apollo and Midnighter an ultimatum that could potentially force one or both of them off the team. I’m also glad we finally get Harry Tanner’s story coming to the forefront. It’s been building for a while and I look forward to the payoff. I honestly don’t have real complaints about the issue. If I had to nitpick, it’s that we get artist Cliff Richards to finish off the last 4 pages of the issue. He’s ok but I prefer Will Conrad. Other than that, I think Milligan is doing well taking the information we learned in Stormwatch #0 and incorporating it into the title. It definitely gives the team a sense of history within the New 52. With the cancellations of Voodoo and Grifter, Stormwatch is the last of the Wildstorm titles from the original New 52 launch. I’m hoping that it picks up because it would be sad to have all the Wildstorm launch titles gone. Here’s to hoping people give it a try (especially with the next trade coming out soon). This entry was posted in DCU, Reviews, Stormwatch and tagged demon, etrigan, Peter Milligan, stormwatch, will conrad. Bookmark the permalink.